2015 Allardt Pumpkin Festival King and Queen. ............ Philip and Jenny Hall are lifelong residents of Fentress County. Philip represents the southern part of the county. A Banner Springs native, he graduated from Clarkrange High School in 1995. Philip then graduated from the University of Tennessee at Knoxville in 1999 and received his Doctorate of Pharmacy from Samford University in 2004. Jenny represents the north side of Fentress County. Jenny grew up in Allardt. She graduated from York Institute in 1995, received her teaching degree in English in 1999 from Tennessee Tech, and her Masters Degree and EdS in Instructional Leadership also from TTU. A true, North – South relationship blossomed for the two beginning during their high school years and into college. Philip and Jenny married in 1999, and this past June they celebrated 16 years of marriage. Philip and Jenny have three children – Trey Michael, a freshmen at York Institute; Andrew, a 4th grader at Pine Haven Elementary; and Julianna, a Kindergartener at Pine Haven Elementary. 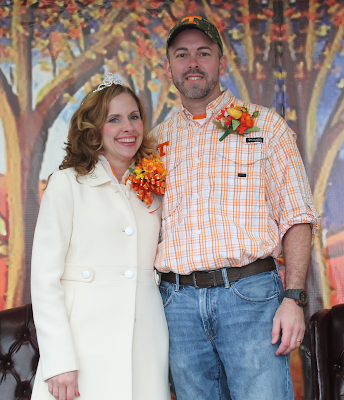 Philip and Jenny love Fentress County and the Cumberland Plateau. They find joy in church, family, and community. The Halls own Hall Family Pharmacy and Soda Fountain in Jamestown. They attend Allardt First Baptist Church where Philip is a Deacon and just recently announced his call into the ministry as a preacher. Jenny is a youth leader, sings in the choir, and plays the piano and organ. Philip and Jenny’s love for their community and their faith in God have permitted them to be one of the top financial and contributors of effort to many local civic and charitable organizations within the area. The Halls partner with the University of Tennessee and Tennessee Tech University to maintain athletic endowment scholarships at each university. Philip and Jenny are huge supporters of the Big Orange and the Golden Eagles. Philip and Jenny are contributors to education on a statewide and local level. Jenny has taught English at York Institute for 16 years and is the Humanities Coordinator at the school. In the past, she has served as the cheerleading coach for 8 years and a Student Council Sponsor. Currently, she is a Renaissance Coordinator. Philip has served for 7 years on the Fentress County School Board. He is a Level 4 school board member for the Tennessee School Board Association. The Halls annually contribute complete funding for all 4 elementary schools and the 2 high schools Science Fairs for the purpose of assistance in the expense for student supplies and awards. Hall Family Pharmacy is the title co-sponsor for the Renaissance programs to promote positive student behavior and effort at both York Institute and Clarkrange High School. They provide funding to Fentress County Youth Sports including the Kirby Johnson Ballpark, Fentress County Cal Ripken League, Fentress County Babe Ruth Jr and Sr Leagues, and the Fentress County Bulldogs elementary football teams. Each year the Hall Family conducts a Vaccine Plus Charity event from September through December, where with each vaccine they administer at their pharmacy, they make a donation to a annually designated local charity. The Halls are active contributors to the Fentress County Senior Citizen Center, the Fentress County Library, and the Fentress County Children’s Christmas Shopping Spree. They maintain an active status with the Fentress County Agricultural Fair as a sponsor and exhibitor. Philip spent 6 years as a Fair Director helping the county fair win 2 Class A State Champion Fair Honors and 1 “Champion of Champion” Honor for fairs of all size and classification. The Hall Family was recognized for their entrepreneurship and business practices at the Southeastern Rural Development Conference in Atlanta this past Spring. Their pharmacy practice has been recognized for “Outstanding Community Practice” by the National Community Pharmacist Association and the American Pharmacist Association. The magazine, “American Pharmacist,” recently published a feature article on Hall Family Pharmacy and their efforts to better rural pharmaceutical healthcare. The Hall Family is also proud sponsors of the Allardt Pumpkin Festival and the Allardt Pumpkin Run. Above all they say and do, it is their goal to be a good neighbor and glorify God. 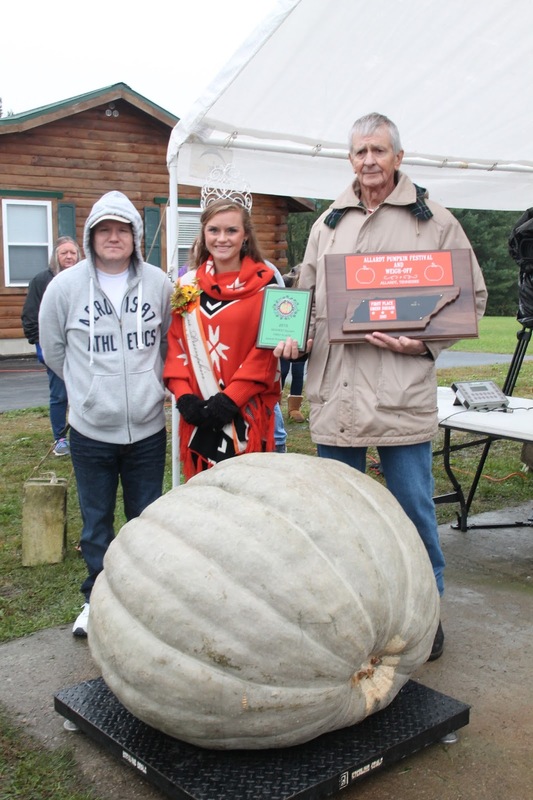 Jason Terry of Oneida broke the Allardt Weigh-off record with a pumpkin weighing 1473.5 lbs. Second place went to Bruce Terry of Helenwood with a pumpkin weighing 901 lbs., and third place went to Jordan Terry of Helenwood with a pumpkin weighing 720.5 lbs. Congratulations to all. From left Raven Mauriece Wright, 2015 Miss Pumpkin, Jason Terry, Bruce Terry and Jordan Terry. The first place winner was also designated the "Prettiest Pumpkin" for its color and overall appearance. 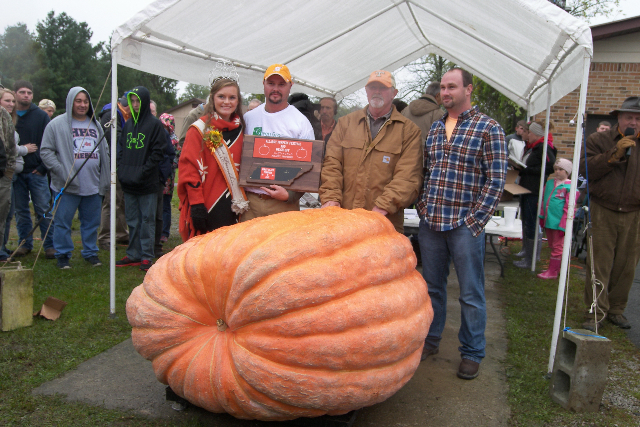 John Brammer of New Hope, KY placed fourth (in pumpkins) with an entry weighing 709 pounds, followed by Gary Volkenand of Allardt with a 603-lb. entry. Dewayne Porter of Dungannon, VA placed sixth with a 453.5-lb entry, followed by Gail Newsom of Pinnacle, NC at 396 pounds, and Suzie Zuerner of Arden, NC with an entry of 219 pounds. In addition to taking first place and $1,000 for his entry, Jason Terry also was awarded the Howard Dill Award for the Best Looking Pumpkin. In addition to the large pumpkins, there were also some giants entered in the Watermelon contest, with Chris Kent of Sevierville taking top honors with an entry of 294 lbs. Although Kent’s entry was far short of the 350-lb. 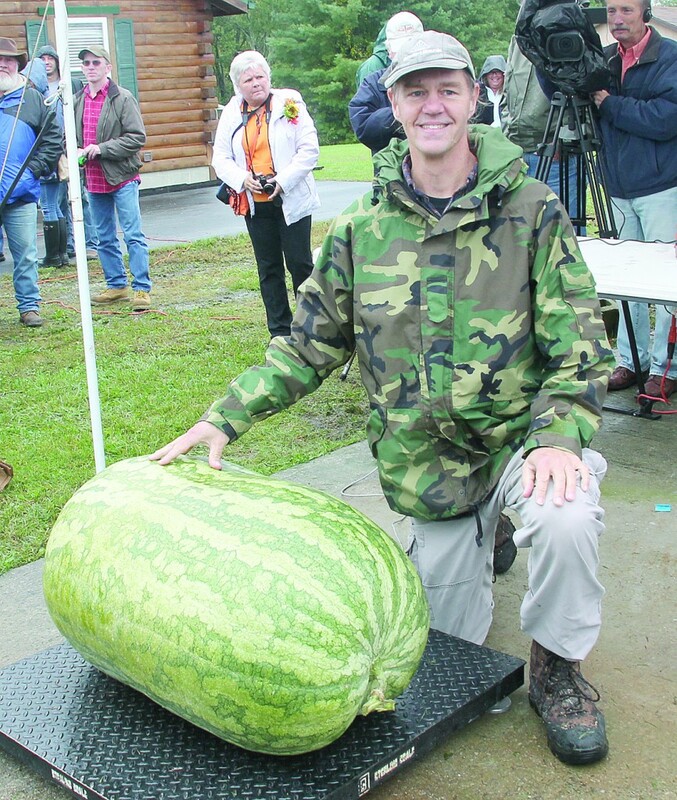 world record watermelon he grew two years ago, it was still a new Allardt Great Pumpkin Festival weighoff record, and almost 50 pounds heavier than the second place entry by Freddie Burcham of Ashland City, TN, who weighed in a 245.5-lb. entry, his personal best. The Burcham family have been coming to the Allardt Pumpkin Festival nearly every year since the festival started, and are always very competitive with their watermelon entries. Taking third place was Jeremy Terry of Helenwood, TN with an entry of 209.5, with members of the Burcham family taking the next four places. Eric Burcham had a 204-lb entry, Matt Burcham at 198.5-lb, 10-year-old Carter Burcham at 181.5-lb, and 6-year-old Wyatt Burcham with an entry of 139.5 pounds. Rounding out the Watermelon competition were Gary Volkenand of Allardt with a 103-lb. entry, and John Brammer of New Hope, KY with an entry of 84.5 pounds. In a new division this year, Chris Kent weighed in a 213-lb. Bushel Gourd. Some of the other winners included Rosetta Allen of Helenwood, TN. who weighed in a 6.5-pound sweet potato. There were three entries in the Long Gourd competition, with Ova Stooksbury of Powell, TN taking top honors with an entry measuring 53.5”; Bill Watson of Knoxville placing second with a 40.5” specimen, and Jane Green of the Red Hill community with an entry of 36.5”. Chris Kent of Sevierville with his 294-lb. watermelon, a new Allardt Weigh-off record. Kent holds the Tennessee state record with a 350-lb. giant he grew in 2013. Thanks to the Fentress Courier for the photo.